You can vote to name the adorable eaglets that were born within days of each other at the National Arboretum last month. 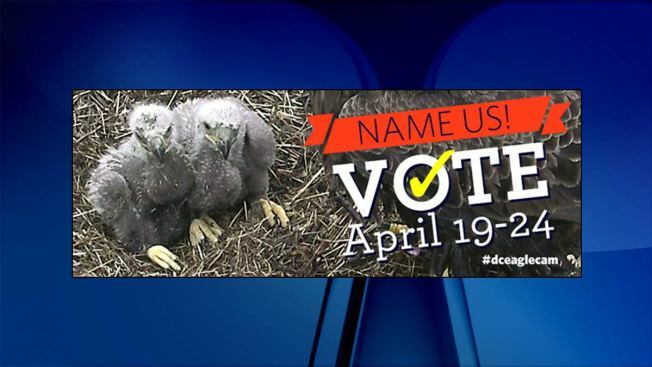 Voting begins Tuesday at 9 a.m. and will run until Sunday at 11:59 p.m.
Friends of the National Arboretum (FONA) are hosting the "voting booth" for the eaglet election. You can enter your vote on FONA's Facebook page. The names will be announced at the National Arboretum next Tuesday, April 26 at 10 a.m. The hatching of the bald eaglets were seen via the American Eagle Foundation's bald eagle nest cam, which continues to show the eaglets' progress. The first eaglet, currently called DC2, hatched March 18, while the second eaglet, known as DC3, emerged two days later. These are the second and third eaglets that were raised by the bald eagle parents "Mr. President" and "The First Lady" at the National Arboretum. Their first eaglet was born last year.